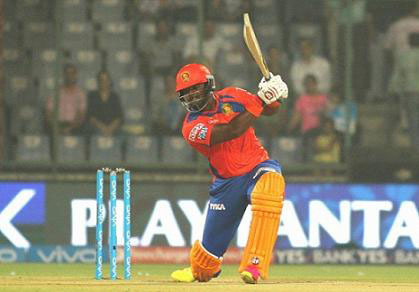 KANPUR, India, CMC – Dwayne Smith’s late cameo earned Gujarat Lions a convincing six-wicket victory over Kieron Pollard’s Mumbai Indians with 13 balls to spare here Saturday, and propelled them to the top of the Indian Premier League standings. The West Indies all-rounder, batting at number five instead of his usual position at the top of the order, stroked an unbeaten 37 off 23 balls as Lions overhauled their target of 173 at Green Park. Lions were 122 for four in the 13th over when top-scorer and captain Suresh Raina departed for 58 but Smith ensured there were no hiccups as he added 51 for the fifth wicket with Ravi Jadeja who finished on 21 not out. Lions have 18 points, two clear of Sunrisers Hyderabad, with Royal Challengers Bangalore, Kolkata Knight Riders, Mumbai and Delhi Daredevils, all two points back on 14 points. Sent in, Mumbai were carried by Nitish Rana’s top score of 70 off 36 deliveries while Englishman Jos Buttler gathered a patient 33. Smith, who grabbed a career-best four-wicket haul in his last outing, again shone with the ball picking two wickets for 37 runs from four overs of seam. Fellow medium pacer and West Indies player, Dwayne Bravo, also claimed two wickets. In reply, Australian Aaron Finch fell to the second ball of the innings without a run on the board but Raina and opener McCullim, who scored 48 off 27 balls, added 96 to put Lions back on course. When three wickets fell for 26 runs in the space of 18 balls, Smith put his head down, belting four fours and two sixes, to ensure Lions got home safely.